After a weekend of revelry, farm folk know it is time to give thanks for the great fun that was had before returning to their regularly scheduled lives. Time spent in praising God for His bounty is always special and the Sunday tradition of Cowboy Church is the ideal way to reflect on the blessings we've received that allowed us to enjoy our rodeo weekend to the fullest. 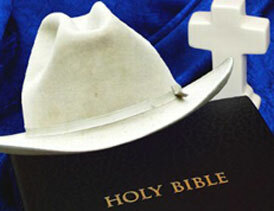 For those who have never been, Cowboy Church is extremely popular among rodeo folk and their followers. This is hardly surprising, as one would expect a certain level of trust in a Higher Power for those who routinely choose to sit astride a snortin', stompin', cranky critter bent on their destruction. As important as Cowboy Church is to the bronc and barrel riding set, it is equally vital for other souls, whose address is also a rural route. These people, too, depend on the Lord for continued safety and prosperity, no differently than their bull-riding brethren. Cowboy Church is as devotional as any service found in a stained-glass cathedral, except with all the superfluous, non-biblical trappings stripped away, leaving just a profoundly spiritual centre. The entertainment is much less pipe organ and much more mouth organ with sing-alongs and entertainment to get the faithful rejoicing like few "regular" churches can. No offering plate is passed from person to person, either, although a hat or boot may be set up at the rear of the room for discreet donations. It is simply an opportunity to have joyous fellowship with our fellow travelers and bring glory to God. It is a recognition you don't need to be formal to celebrate His love. Of course, all are welcome at Cowboy Church, whether you wear boots and spurs or diamonds and furs. The congregation is a mix of everyone just as the world is; just as it should be. 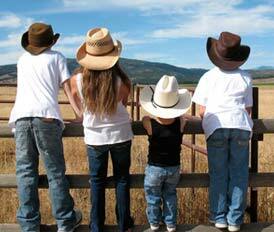 Making Cowboy Church a part of your rodeo experience is a decision you won't regret. See you there!